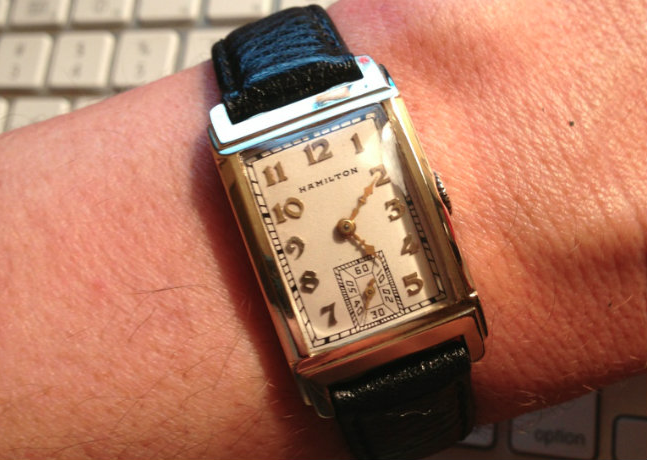 Issued only for one year, the 1935 Hamilton Wayne was one of the first watches to feature the newly introduced 19 jewel, 14/0 size 982 movement. The Wayne was introduced with another watch called the Ardmore. Both are towns on the historic "Main Line", the railway that left Philadelphia and headed West toward Lancaster PA and points beyond. The Wayne is a solid 14K gold tank-style watch with highly polished surfaces tapering down to the lugs. It was only available with an applied gold number (AGN) dial. At this point in Hamilton's production, the solid gold watches received the 19 jewel 982 movement and the gold filled watches got the 17 jewel 980 movement. Later on, Hamilton introduced the 982M Medallion movement that would be used in solid gold models. One interesting factoid about the Wayne is it has male lugs and requires female spring bars to attach the strap. That means instead of holes in the case to receive the spring bar, the case has metal tangs that stick out and the spring bar is more like a spring tube with holes on the ends to receive the tangs. Finding spring bars with holes large enough to accommodate the male stubs is always a challenge. I recently had the opportunity to overhaul a friend's Wayne and I found it interesting that the movement had a very low serial number... 5000-something. It's a nice looking watch and it turned out great... and the best thing of all is there's no wear through!